Discussion in 'Android Lounge' started by Gujustud, Dec 19, 2009. 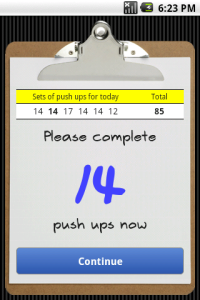 I recently started doing the one hundred push ups challenge. They have a online logger. I'm also going to be starting the two hundred sit-ups soon. I noticed they have a online logger, and also a iphone app. Any chance that someone could make a simple app that can do the logging (very basic) along with having the charts? It would make it easier then having to go and check it online all the time. Anybody got anywhere with this..?? I'd also be interested in an app for this - it would even be one I'd be willing to pay a (small) amount for...! 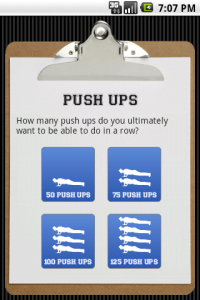 Basically, getting you to doing 50, 75, 100 or 125 push ups in a row -- that is what the Push Ups app is all about. 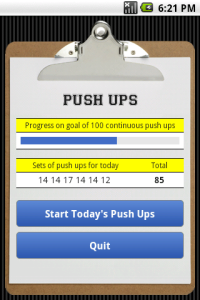 So you can do your one hundred pushups or more, just as you like.